Junkyard Life: Classic Cars, Muscle Cars, Barn finds, Hot rods and part news: That Fad "T": T Buckets were the original hot rod rage, where are they now? That Fad "T": T Buckets were the original hot rod rage, where are they now? Buckets of love from days gone by. I love cars. I really do. The Junkyard Life Guys will go to great lengths just to see a car in any condition. If you’re a frequenter of Junkyard Life, then you know just how extreme we can be. Or so we thought. The car guys from the ’50s, ’60s and ’70s make us look like the Harper Valley Chess Team. More specifically, the T-Bucket guys. Those guys had nerve. Those guys knew what fast was and they made it happen. If you think your 280 Z with a small block Chevy is an original idea, think again. If you think your Miata with that insane power-to-weight ratio 5.0 Ford is fast (good heavens, I know it is!) or that RX-7 with the transplanted LS motor is a new thing, wrong-o, Fast-and-Furious boy. The T-Buckets led the way in the 1950s for unbelievable, ridiculous power. By the early seventies they were the rage. 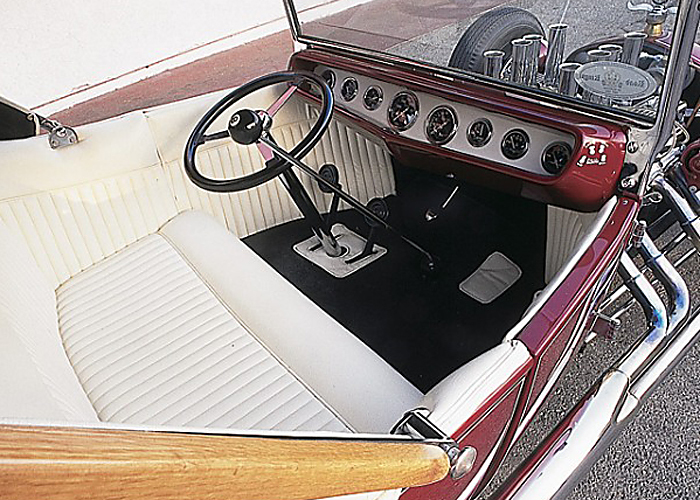 Kookie Kar, a customized 1922 Ford Model T, built by Norm Grabowski became THE iconic hot rod in the 1950s. A model T Ford is the basic concept for the T-Bucket. You were riding around in a bucket that used to be a T-model Ford. By the fifties, there was an abundance of early to late 1920’s cars laying around in barns, alleys, back yards and junkyards — seemingly everywhere. Car guys, being the pioneer recyclers, put these automotive remains to good use. They swapped, modern for-the-day, engines into a chassis designed to hold a fraction of the torque and horsepower that they were now harnessing. The good, old recipe for a fast car — lots of power, no weight. As time went on and V-8 engines were abundant and affordable, they only got faster. 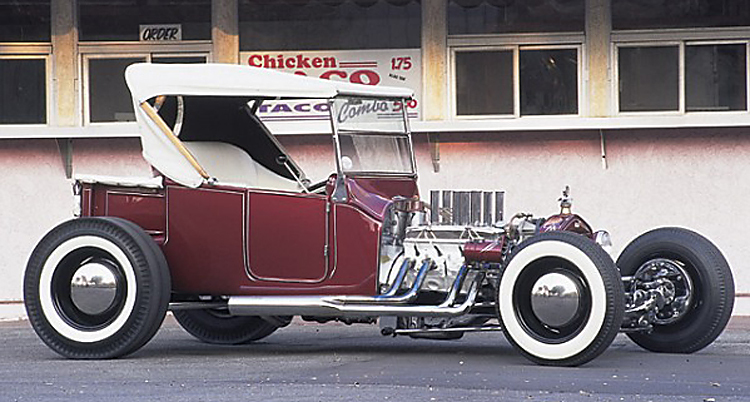 Actor/drag racer Tommy Ivo's Buick-powered T Bucket. T-buckets were street monsters. Take a V-8 and add multiple carbs and unrestricted headers. For traction, add a super strong Mercury, Corvette or Jaguar rear end and massive fatty tires on the back. Up front, to save weight, how about tiny wagon wheel pizza cutters on the front? A back seat would only add bulk, so forget that. No fenders, no hood and usually no roof would be uncomfortable in the winter, but are we men or mice? Absent were things we take for granted, like seat belts. Maybe today you might see a bucket with belts, but back then it was a rarity. 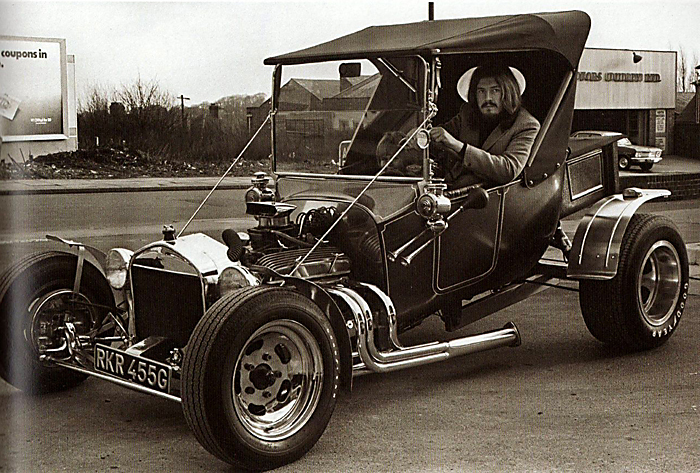 The steering column was more or less a giant spear waiting to impale you. Power brakes, right? Oh. Brakes, yeah-that’s not working out so well due to drum brake technology at the time and the disproportionate skinny bicycle-like tires in front. So some of them had… no front brakes. Are these guys daring? Crazy? Suicidal? Yes, yes and yes. T-Buckets were also fun and addictive. 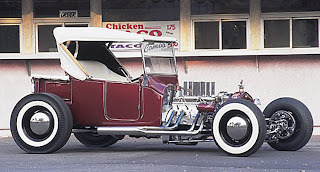 Tommy Ivo's T' Bucket Hot Rod sports a custom Von Dutch pinstripe. How fast are we talking? The one I rode in was basic bolt-ons and nothing exotic. It didn’t have to be, it was so light! Today it would be compared to putting a small block Chevy in your lawn mower or your kid’s go cart. Can you imagine a street race crowd of T-Buckets about to line up. That would be great to watch, like maybe from a distance. If you lived through it, you just might get street respect, also I have heard that back then it was not uncommon for a girl to arrive with someone and leave with the guy in the faster car. So where are you now, T-Buckets of yesteryear? We here at Junkyard Life know of a couple here and there, but the masses have seemingly disappeared. Do you know of one that makes appearances around your town? If you know of one sitting dormant in a basement or barn, let us know. We would love to do a story on one and the times it has seen. T-Bucket guys, you’re crazy, but we love you! Lets hear from you soon. 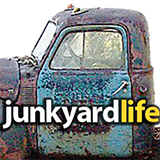 Know of a junkyard we need to visit or want to send us photos and info about a car or junkyard? Send emails to Ron at Kidd403@bellsouth.net or Jody at junkyardbull@gmail.com. Super cool article! My Uncle in New Orleans has a "T" he remodeled that's insane.